Single tier cakes can be lovely wedding cakes. 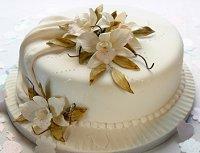 Wedding cakes that have a single tier can be very elegant. This cost saving option is ideal for couples wanting a decadent dessert to celebrate their nuptials without having a large multi-tiered cake. One delicious tier can be the perfect size for a couple's wedding cake for many reasons. A small, casual wedding with a small guest list will not require a gargantuan dessert, or a couple may choose a single tier cake to share after they've eloped. Several single tier wedding cakes could be used to offer guests a wider range of flavors, or a single tier cake may be the perfect size for a couple who wants to cut a wedding cake for the nostalgic photographs but who doesn't really like cake. Many couples also choose single tier cakes to celebrate their anniversaries, often choosing the same flavors and designs they tasted on their wedding day. Whatever the reason, there are many beautiful single tier cakes that can bring an extra taste of sweetness to a wedding celebration. Augmenting the cake with wedding cupcakes in different flavors to offer additional treats and serve a greater number of guests. Design faux cake layers to serve as base tiers and give the small cake an illusion of greater size. Using an elevated wedding cake stand to lift the cake above the table and make it seem larger than it really is. Adding additional desserts such as wedding truffles, mini tarts, gourmet cookies, or other treats to create a dessert buffet. Coordinating a single tier cake with the groom's cake as his-and-hers desserts. 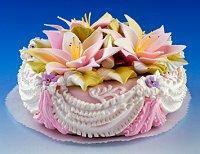 Choosing several single tier cakes of different designs and flavors to suit a variety of taste preferences. One of the biggest concerns with a small wedding cake is what to do with the wedding cake top. Many couples cherish their toppers as mementos of their special day, but a larger topper can easily overwhelm a single tier cake. To prevent an unbalanced appearance, couples can opt for smaller toppers or choose to put the topper next to the cake as part of a lovely table decoration instead of setting it on the cake itself. Flowers, the guest book, framed photos, a wishing well, or other accents can also be a part of the cake table and will help keep a smaller cake from looking out of place on a large table. Single tier cakes may be delicious and delightful, but they are not appropriate for every celebration. 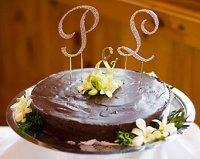 Before choosing a small cake, couples should carefully consider the pros and cons of single tier cakes. If a couple does choose a small, single tier cake to serve as their wedding confection, finding one should not pose a great challenge, particularly if they are interested in simple designs and classic flavors. Most bakers will be able to create smaller cakes, though if a couple wants an unusual flavor or one-of-a-kind wedding cake the bakery may have minimum size and price requirements to compensate for their efforts. As an alternative, couples could negotiate to order a bridal shower cake, groom's cake, or rehearsal cake as part of the whole wedding cake package. 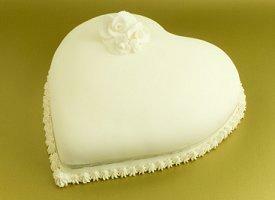 Single tier cakes can also be easy for couples to make themselves. A talented family member or wedding guest may be able to create a small, elegant cake for the festivities, often at a fraction of the price compared to bakery designs. Some guests even offer to bake the couple's cake as their wedding gift, adding a unique touch to the couple's celebration and simultaneously helping them save money. Single tier wedding cakes can be lovely options for small celebrations, multi-dessert events, or just for couples who prefer a more understated pastry as their first taste of married life. With just as many options as larger cakes, small wedding cakes are big on taste, romance, and nostalgia.